I have a confession to make: I didn’t care much for Rufus Wainwright’s last album “Release the Stars.” With some time between and some Rufus vacation, I returned to the music, able to listen again with fresh ears. Much of the RELEASE music is on the live album, “Milwaukee at Last” just released as a combo DVD and CD, is performed here. 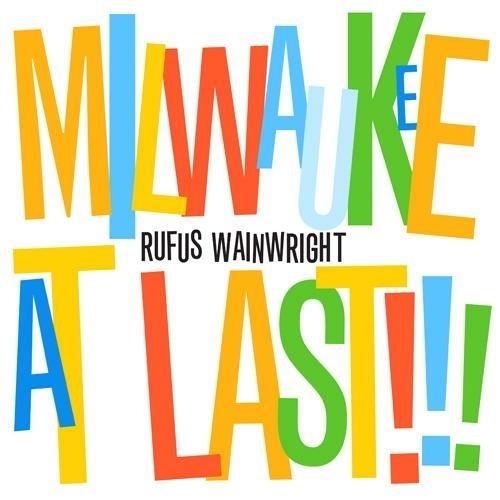 Filmed and performed in Milwaukee, where I lived in the summer of 1973, Rufus is in the middle of the tour, the music is impeccably performed, and Rufus––as a singer, pianist, guitarist, and songwriter––is at his peak. There are interviews with the band members, clips and close-ups of the audience listening to his music, and of course LOTS of Rufus chat. In that every performance is so intense, the banter in between works well as a published live documentation. Seeing the “Release” songs live here make them come to life. All these songs “work” for me now. I get it. I am overjoyed to see Rufus spending time crafting the difficult piano part in “Tulsa” as well as playing it and sing it at the same time. The CD version of this song had a string quartet––it works fine as a solo piano and voice arrangement, especially here. Rufus nails it. Every member of the band (all male here btw) is a virtuosic multi-instrumentalist as well as a singer. I realized that this is not so far from the Philip Glass or Steve Reich ensembles in their early years–a little chamber orchestra to tour playing your music. What is interesting is how that instrumentation changes with every tour. Gerry Leonard is the musical producer and guitarist for this show and does a terrific job. He is clearly senior to everyone else: hats off to Rufus for being consistently intergenerationally inclusive.